An open letter to President Donald J. Trump, Senate Majority Leader Mitch McConnell, and House Speaker Paul Ryan. 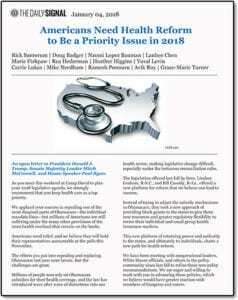 As you meet this weekend at Camp David to plan your 2018 legislative agenda, we strongly recommend that you keep health care as a top priority. We applaud your success in repealing one of the most despised parts of Obamacare—the individual mandate fines—but millions of Americans are still suffering under the many other provisions of the 2010 health overhaul that remain on the books. Americans need relief, and we believe they will hold their representatives accountable at the polls this November. The efforts you put into repealing and replacing Obamacare last year were heroic. But the challenges are great. Millions of people now rely on Obamacare subsidies for their health coverage, and the law has introduced wave after wave of distortions into our health sector, making legislative change difficult, especially under the torturous reconciliation rules. The legislation offered last fall by Sens. Lindsey Graham, R-S.C., and Bill Cassidy, R-La., offered a new platform for reform that we believe can lead to success. Instead of trying to adjust the subsidy mechanisms in Obamacare, they took a new approach of providing block grants to the states to give them new resources and greater regulatory flexibility to revive their individual and small group health insurance markets. This new platform of returning power and authority to the states, and ultimately to individuals, charts a new path for health reform. We have been meeting with congressional leaders, White House officials, and others in the policy community since last fall to refine these new policy recommendations. We are eager and willing to work with you in advancing these policies, which we believe would have greater traction with members of Congress and voters. Chairman Lamar Alexander, R-Tenn., has been working with Sen. Patty Murray, D-Wash., on short-term subsidies and state flexibility. These efforts are commendable, but they do not alter the basic structure of the law and will not provide the relief that Americans desperately need. Health premiums continue to soar, and millions of people have little or no choice of health insurers. Millions of people who once could afford coverage no longer can, and many find that their health insurance premiums cost more than their mortgage or rent payments. These same people, as federal and state taxpayers, also are paying for Medicaid—which now covers one in four Americans—and for sharply higher federal costs to subsidize Obamacare individual policies. In a new Associated Press-NORC poll, nearly half of Americans said health care is their primary concern for 2018, topping taxes, immigration, education, and the environment by more than 15 percent. Obamacare has failed miserably in fulfilling the last administration’s promise to cut health costs. The typical American worker now must devote roughly twice as many work hours to cover health costs as to pay for food. Health costs are rising faster than before, and there’s no real prospect of a reversal without legislative action. The individual health insurance market is contracting: Preliminary numbers show that the total number of people with individual policies fell from 20 million in March 2016 to 16 million in September of last year. That’s a 20-percent drop in a period of 18 months. The year-end estimates are likely to show that fewer people have individual health insurance coverage today than at any time since 2014. Washington has exacerbated the problems in our health sector. We believe individuals need to be empowered with greater flexibility and choice and that states are better equipped than Washington to oversee their health insurance markets. This requires legislative action from Congress for these new and better choices. We applaud the administration’s efforts in creating regulatory relief from Obamacare where possible, including releasing today a new regulation for broader adoption of association health plans. We look forward to aggressive agency action in implementing regulatory relief, but more action is needed. We are ready to work with you in building on your successes, and are developing consensus solutions that would enable greater competition so Americans can choose the coverage that is right for them, with more options of more affordable insurance policies and health care, while protecting health coverage for those who have it now. We believe this new approach can lead to a successful outcome, and we encourage you to create the path by making reform a priority in your decisions about your 2018 agenda.